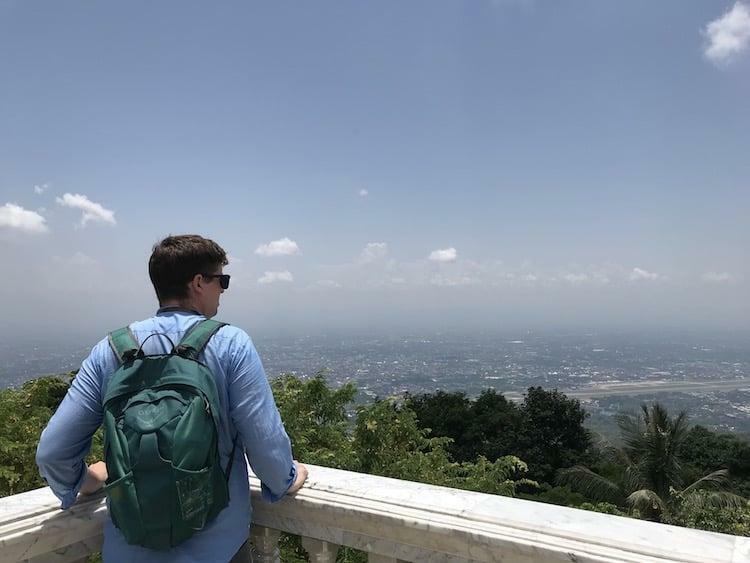 Having been on the move around Thailand for a few weeks, we decided to end our trip by putting down roots for 5 days in Chiang Mai. They were pretty fast growing roots admittedly, as we were there just under a week, but compared to the rest of our time in Thailand this felt like an age! 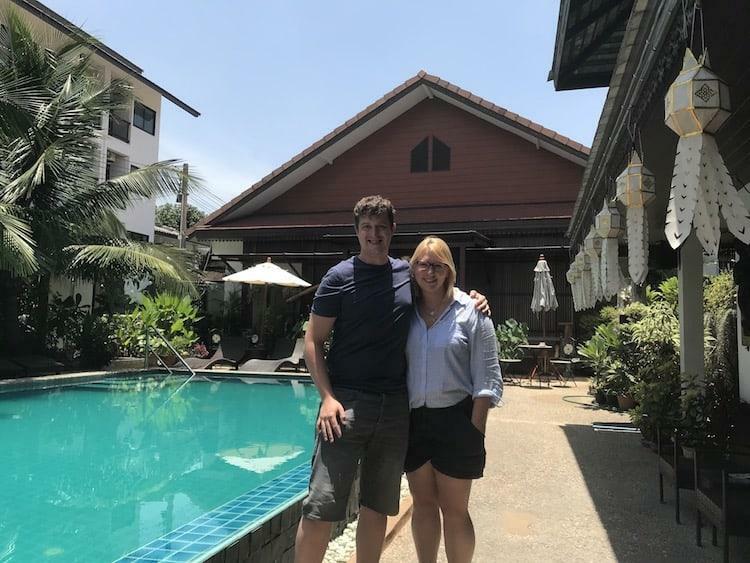 Chiang Mai is known for its backpacker hostels, and cheap eating, but we decided now was a time for just a little bit of luxury in our lives. This was to be the last week of our month in Thailand, so we wanted to go out on a high! 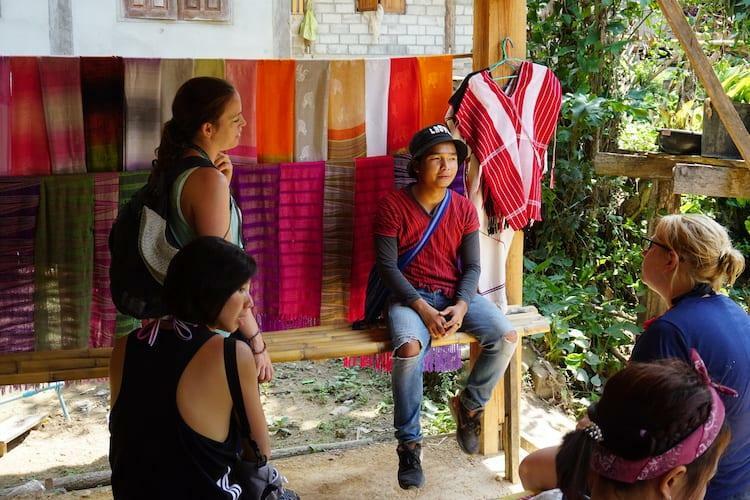 Not ones to take life easy though, we got through a fair amount in our five days in Chiang Mai, below is a guide to some of the specific things we did, that will help if you want to repeat any of the steps. P.S. there’s a map down at the bottom of this post if you want to see the locations of the places mentioned. 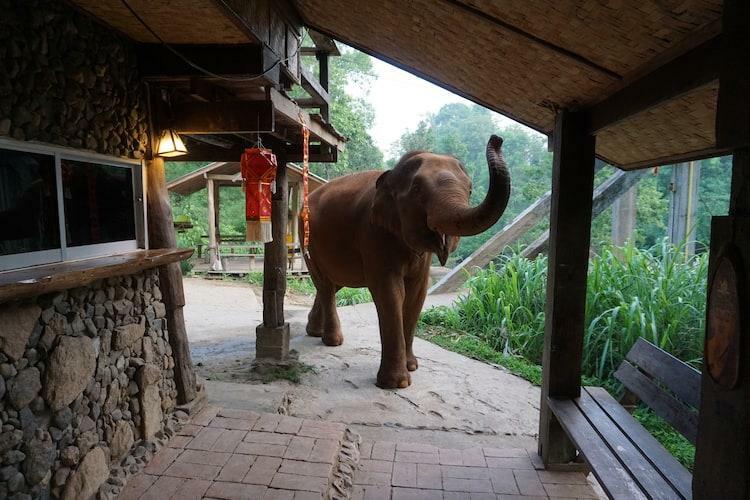 We spent our time in Chiang Mai itself in a WONDERFUL guesthouse called Viangdara (we had one night away at an elephant sanctuary, but Viangdara were happy to look after our bags). When I say we went for a bit of luxury this is what I mean. We wanted a guesthouse we could chill out in when we weren’t exploring, and Viangdara was perfect for this. It had a pool, and a lovely seating area with tables, daybeds and board games above reception. The owner and her staff were wonderful; always helpful, eager to learn more about our travels and really good-humoured (though alot of the jokes seemed to revolve around the ‘food baby’ that I came back with after trips out to the street food markets, in fairness these jokes were led by Becca and not them!). It was a bit more expensive than other places we’d stayed in Thailand, but at £30 a night it wasn’t bad by western standards. Having done our best to save money on the rest of the trip, we just fancied a week where weren’t confined to a single room, and the pool was definitely an added bonus. To prove what a lovely bunch they were check this out…. A few days after we left, Becca opened her email and found this note…. A small gesture, but not one I’d ever seen before, and brought a massive smile to our faces when we got the email. After staying one night at Viangdara we headed straight out on a pre-booked one night (two day) stay at Chai Lai Orchid, which had been recommended to us by some friends back in the UK. 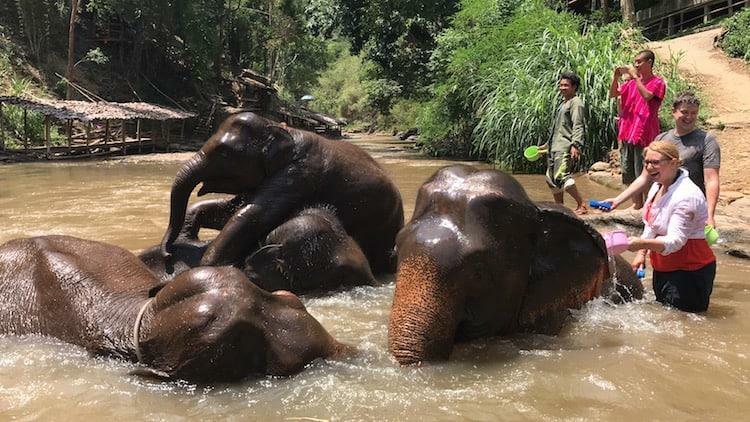 They have so far rescued five elephants from the tourism industry, and rent many more to keep them safe. They picked us up from the hotel just after 0800 and took us 45 minutes or so outside Chiang Mai to their location in the hills. The first part of our day was walking with a group of elephants. Chai Lai Orchid have bought land that they can use to exercise the elephants they keep, and we took a family of five up the hillside into the jungle for a late breakfast. After the walk we took the elephants down to the river, where we gave them a wash as the babies had a play. Whilst we would all much prefer to see these majestic beasts out in the wild, the reality is that is become more and more difficult in Asia. Without places like Chai Lai Orchid these animals would be put to work in the logging or tourism industries and live an awful life. Here, whilst they don’t have complete freedom, they are well looked after, and look very happy. Not quite as happy as we were though! 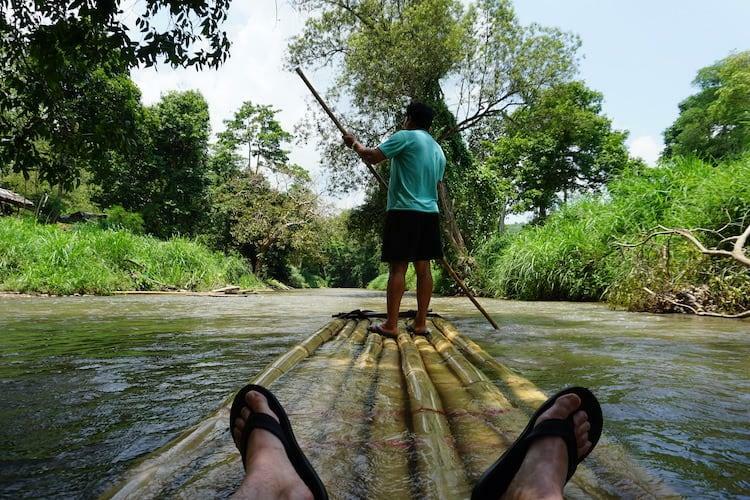 After the elephants were led away for yet more food, we hopped into the back of a pickup and were driven a few minutes up the road for some bamboo rafting. After we’d negotiated our way on to the long thin rafts, we were punted along the river back to base. It was a peaceful journey down through the forest that lasted about half an hour. The river was calm, which was lucky as the rafts were half submerged already! We arrived safe, despite numerous (false!) shouts of “CROCODILE” from the boy paddling at the back, who clearly liked to try and wind up gullible tourists! 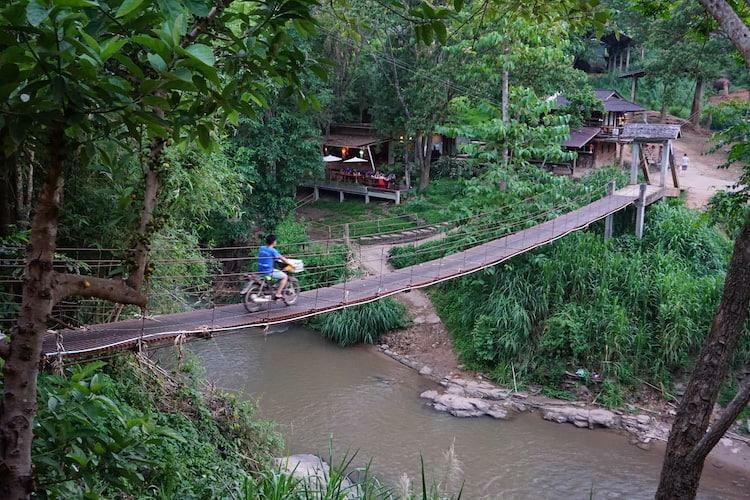 For the evening, we were due to head over to a hill-tribe village, but we decided to stay at Chai Lai Orchid as we wanted to see the elephants before out trek in the morning. Not heading out to the village turned out to be a good decision. We got up for sunrise the next day, and watched the mahouts getting the elephants ready for the day. Some of the older ones were allowed to roam freely around the area, and, as you can see, they are very familiar with the buildings! After breakfast, another change of pace. We were driven high up into the mountains with a guide called Chani who was from one of the local Karen hill tribe villages. 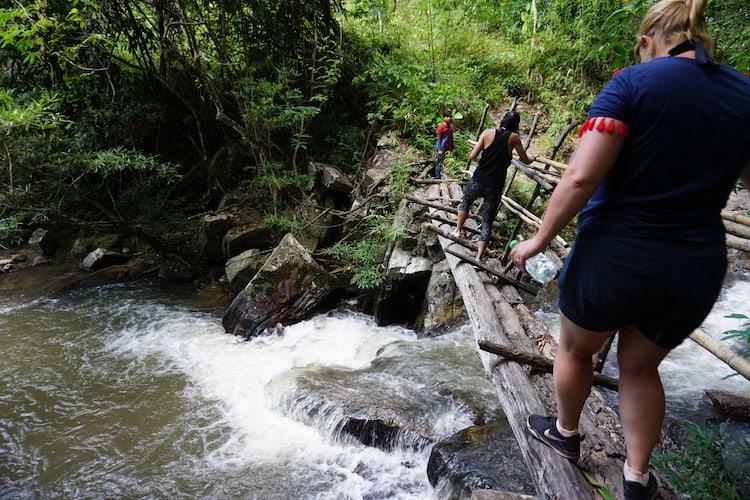 We trekked through the forests for about three hours, taking small paths and old bridges that could only have been found by someone with knowledge of the area. In the morning we stopped for about half an hour for a refreshing and much needed escape from the heat at a waterfall in the middle of no-where. 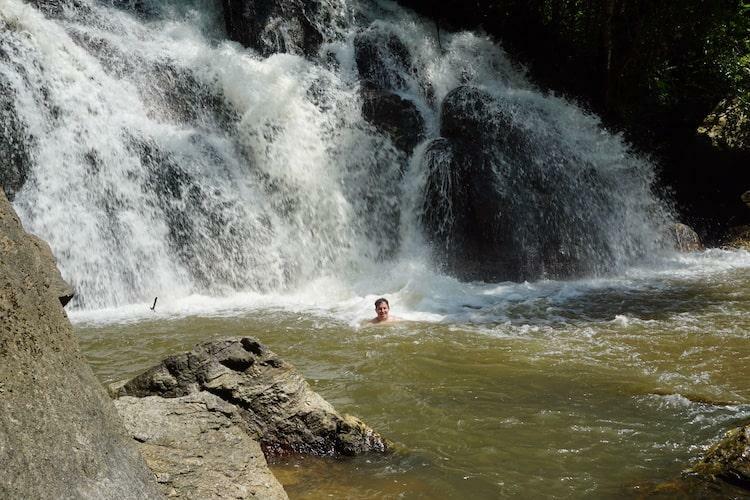 There was also a second set of pools right by our lunch stop, where we could slide down through the mossy rocks like a natural waterpark. After lunch we walked the short distance to Chani’s home village, where he showed us around before telling tales of his childhood and Karen culture whilst we sat and watched traditional weaving. After this it was back to Chai Lai Orchid, before hopping in the back of the pick-up again and being taken back to Viangdara. It had been an incredible couple of days, packed with unique experiences. All in we paid around £200 for the two days, which included all the experiences, one night’s accommodation, transfers from and too Chiang Mai and the food we ate, with a few extras thrown in for the beers and cocktails we drank whilst we watched the sun go down. On our third day it was time to explore Chiang Mai itself. There are hundreds of detailed itineraries out there, and this is not going to be one of them! My advice – forget about them, set aside a few hours and just walk. Stop off at temples, dive in and out of side streets and watch the world go by. The old town of Chiang Mai is set in a 2km x 2km square surround by a moat, so just follow the streets around and see what you find. 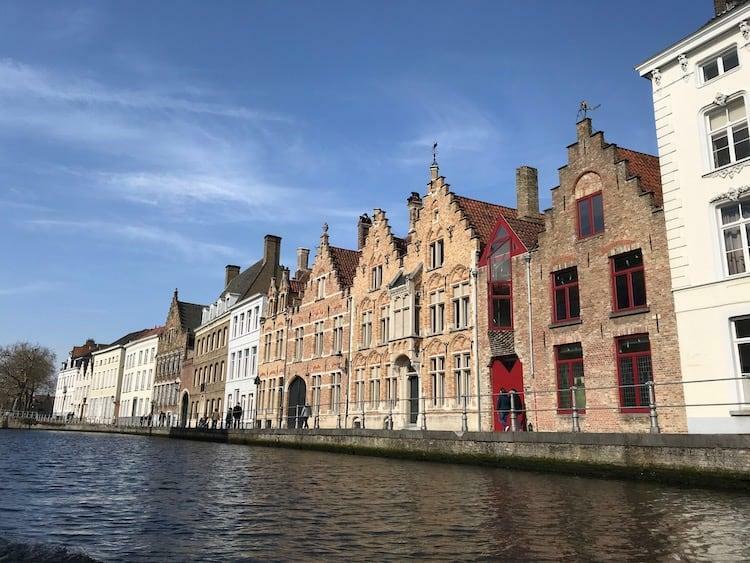 You can read all the itineraries you want, but you’re unlikely to miss too many of the big attractions if you just give yourself time. 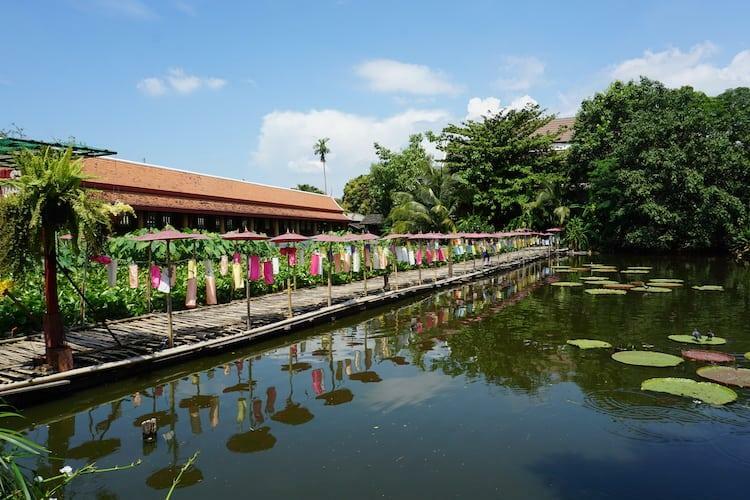 The second oldest temple in Chiang Mai, but we loved it because of the carp pond out there back, bordered by a bamboo bridge and filled with lilypads. We arrived as hundreds of schoolchildren appeared to come and feed the fish! 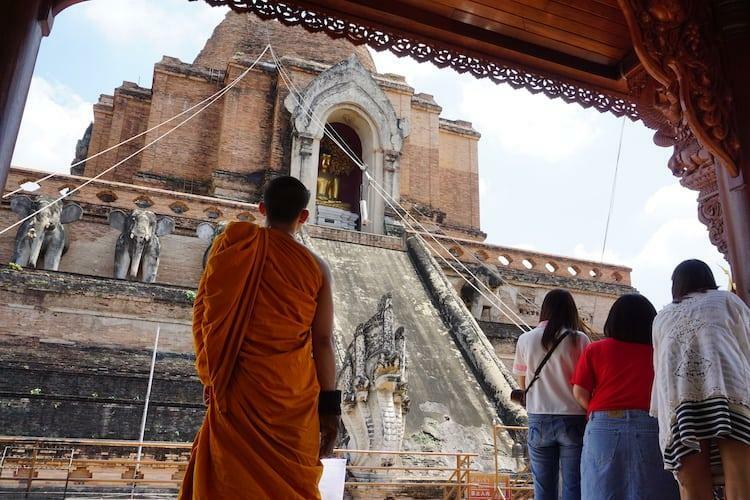 Wat Chedi Luang is right in the centre of Chiang Mai, in a complex that also includes the city pillar, Wat Phan Tau and various other temples. We had arrived at the same time as the annual City Pillar Festival, and there was lots of activity going on getting the area ready for the final night. In the photo above canisters were filled with water, and then winched to the top before being tipped over the shrine as part of the ceremonies. Wat Chiang Man is near the northern edge of the old city, but well worth the work. 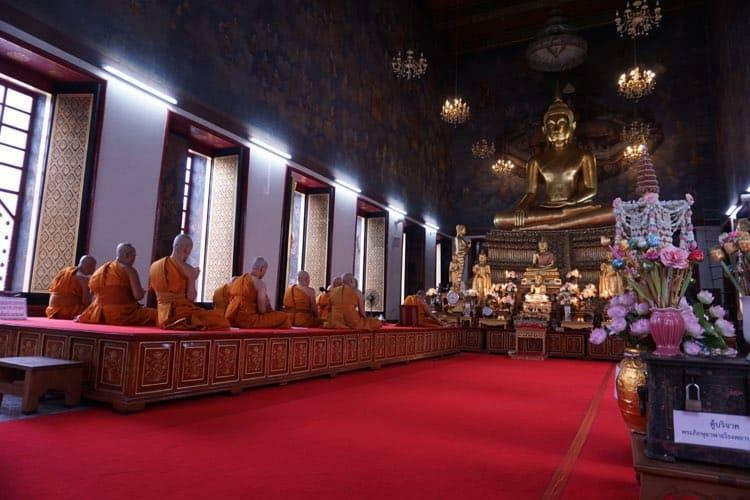 It is the oldest temple in Chiang Mai, and one of the buildings houses the stunning Phra Kaew Khao or Crystal Buddha. 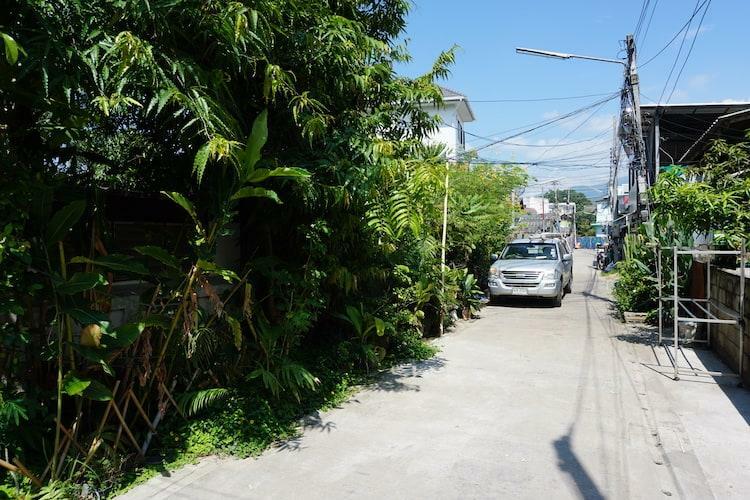 To fall in love with Chiang Mai, you have to fall in love with exotic, narrow and slightly higgeldy-piggeldy side streets. Some look like they don’t lead anywhere, some like they might be nothing more than driveways, but most are harbouring secrets, from hidden temples to cool little cafes. 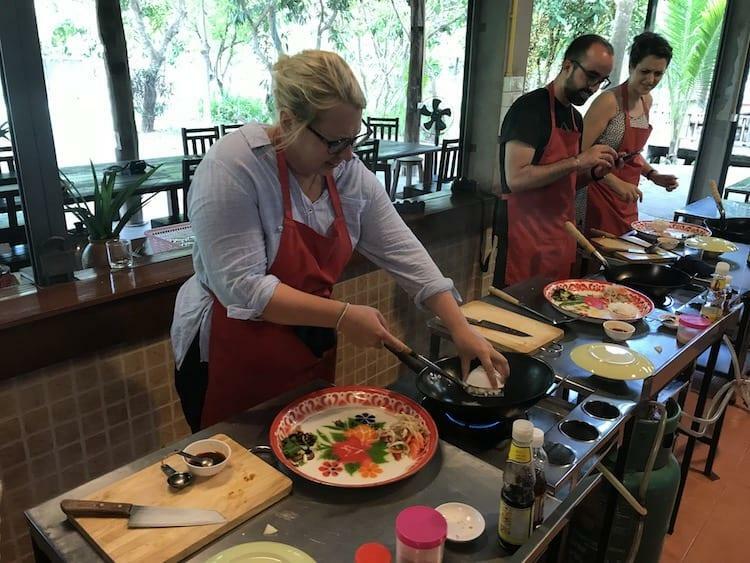 Thai cooking classes come heavily recommended on every ‘must do’ list for Chiang Mai. 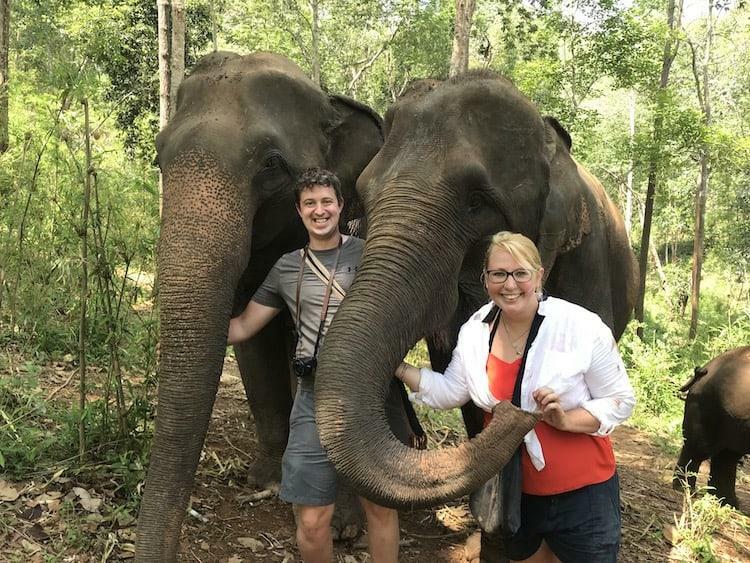 Our reasons for taking one were slightly different – my want for unlimited spring rolls, and my frugal side looking for a way to side-step the expensive Thai restaurants at home. Ok, the real truth is some friends of ours had recommended one just before we left the UK, but the reasons above weren’t far off either! We booked ourselves up for a full day course ThaiCookingFarm.net having read hundreds of amazing reviews. £32.50 each for a full day, including pick up, a recipe book and all the meals (believe me, skip breakfast, you will eat more than enough today!) felt pretty reasonable. 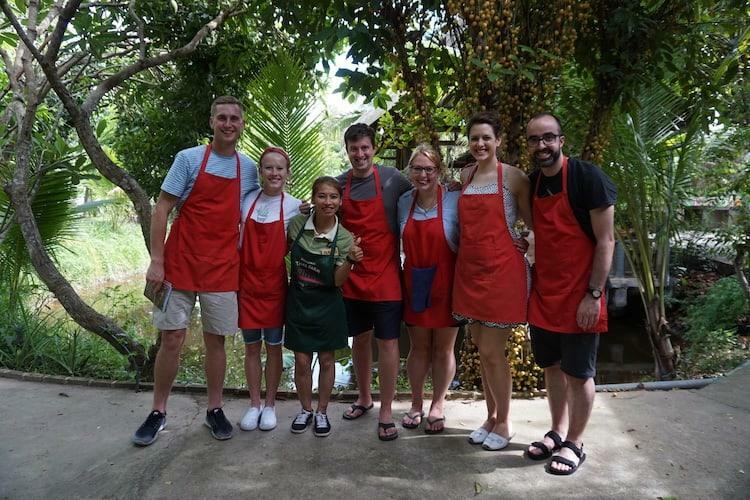 We were lucky enough to be linked up with a great group, and led into battle by the fun-loving Wass, who took us through a full day worth of recipes – curry pastes, soup, spring rolls, green/red or yellow curry, stir fry and a sweet dish. And yes, we got to eat it all! No wonder I showed up back at the guest house with a ‘food baby!’. Not only did we learn alot, but we had great fun all day. Wass was an amazing teacher, showing patience and good humour right the way through the day. It was amazing to see the food right the way through, from going to the market in the morning, picking fresh herbs in the farm garden, crushing our curry pastes by hand and cooking the ingredients ourselves. The only thing they wouldn’t let us do was the washing up, but, I didn’t mind too much! Day 5, you’re almost done! Stop one is the stunning Silver Temple. This is a little bit outside the old city, but really easy to access from the guesthouse listed above. It’s men only allowed inside (sorry Becca) but the grounds themselves are well worth the trip too. 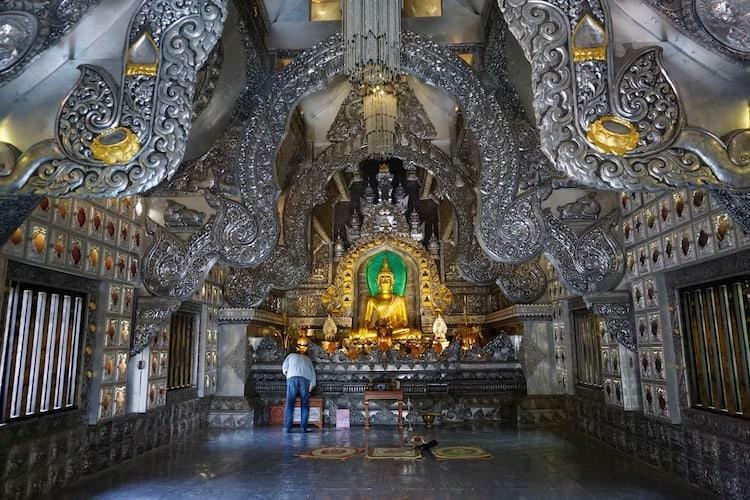 The temple is ornately clad in silver, the only one of its type in Thailand. Around the edge are intricate statues and ornate pictures etched and sculpted into the metalwork. Next, time to head up to the best view of Chiang Mai, from the hilltop temple of Doi Suthep. It is quite a way out, but it is fairly easy to access. Get a taxi to the Chiang Rai Zoo (we prefer to use Grab which is the Uber of Southeast Asia), where you will find lots of red songthaew taxi trucks that will take you to the tob. The taxi cost us 80฿ from the Silver Temple, and the ride to the top was 40฿ each, though you have to wait until there is a full truck of people. Beware, the roads are quite windy, and the journey around 20 minutes, so you might want to take a travel sickness tablet beforehand! 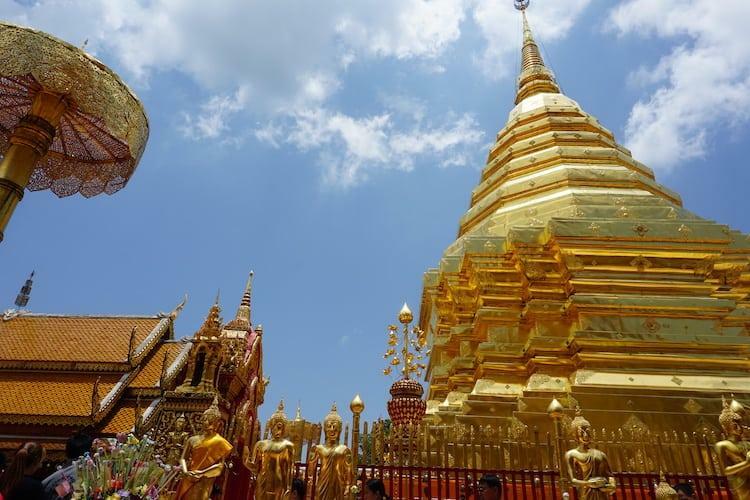 At the top you’ll have 300 steps to navigate, before being greeting by the sparkling gold pagoda of Wat Phra That Doi Suthep (30฿ per person entry fee). 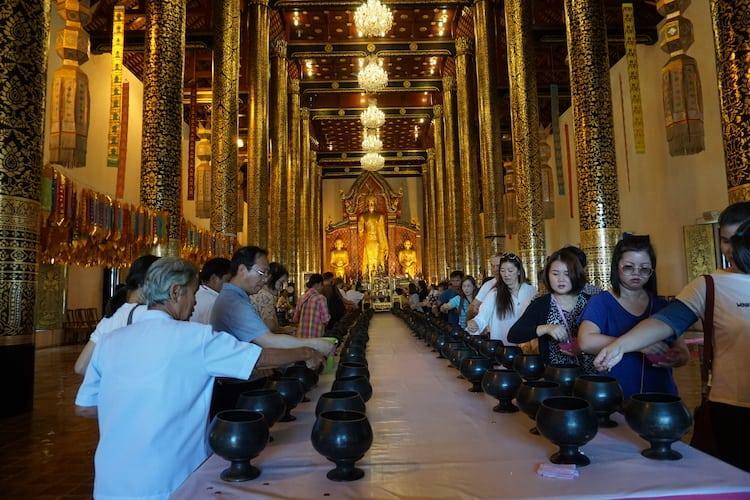 The temple complex gets very busy, as it is one of the most sacred sites in Northern Thailand. Here is said to be buried a fragment of bone from the Buddha’s shoulder, that was brought to this location by a monk on a sacred white elephant. 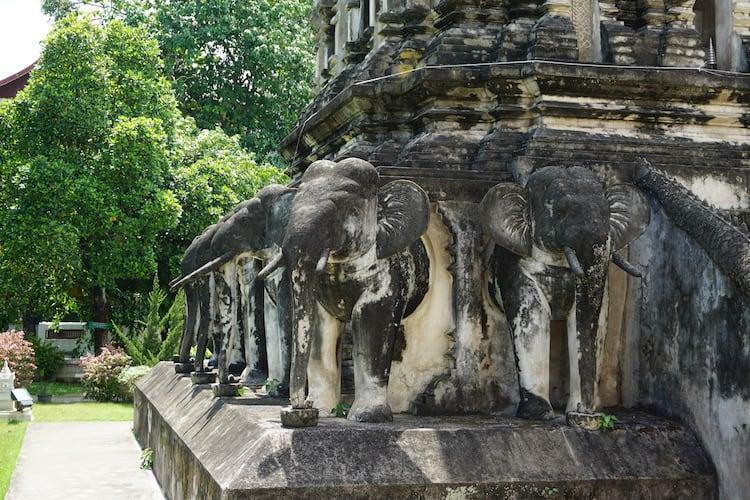 The spot where the elephant died, became the location for the monastery. The views down over Chiang Mai and the surrounding plains are spectacular from up here, and make the journey up the mountain almost worth it by themselves. 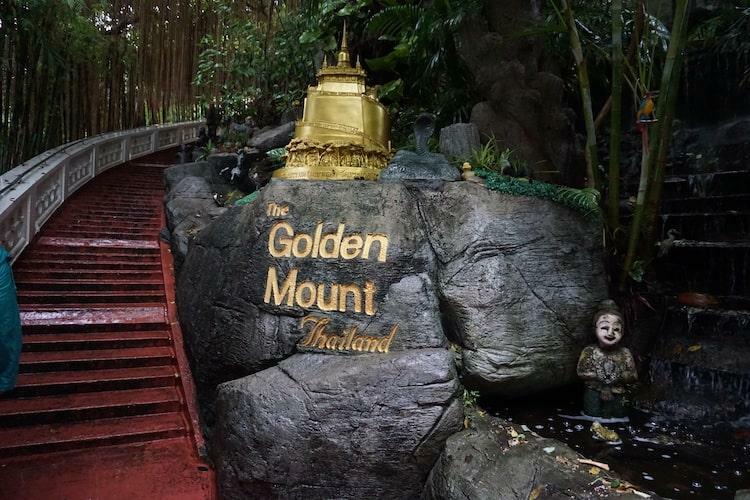 After you’ve navigated your way back down from Doi Suthep (the songthaews will take you all he way back into town for around 60฿), enjoy an afternoon of relaxation before heading out to Chiang Mai’s famous Sunday market. Clearly this element of the trip will depend on when you are in Chiang Mai! 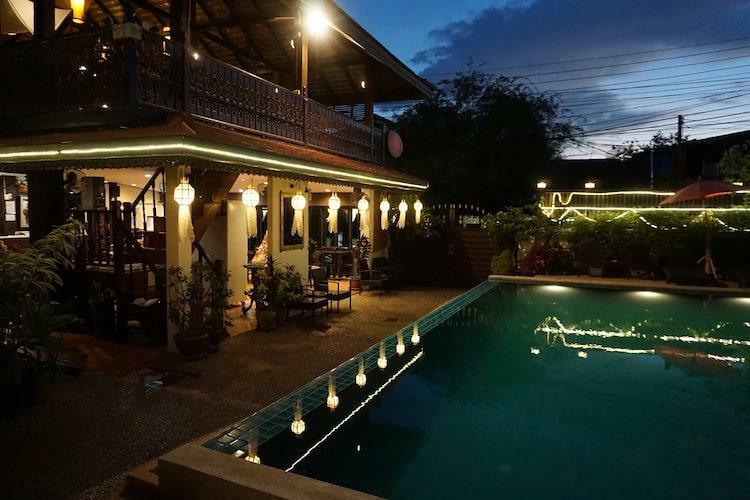 Hopefully at least one of your nights in Chiang Mai will be a Sunday, and the days above can easily be moved around to fit your plans. If you’re not then there is a night bazaar just outside the city walls that runs every night. Whilst a bit more touristy than the markets in other cities such as Chiang Rai, Chiang Mai’s Sunday market is still an experience that can’t be missed if you’re in the city at the right time. Amongst the wooden statues, traditional garments and unique artwork you will also find incredible street food. 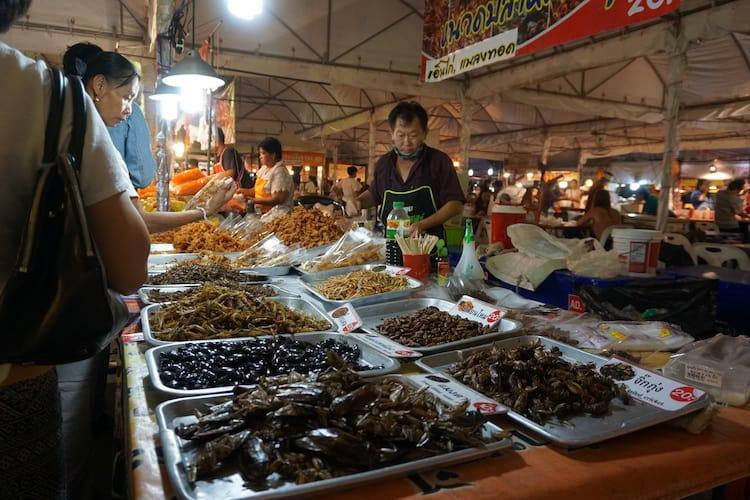 Our favourite place to hang out was just outside Wat Phan On, where there are lots of food stalls with seating, meaning you can pick and choose your perfect dinner from multiple cooks! You will need to zoom out to see the location of Chai Lai Orchid and the Thai Cookery School as they are outside central Chiang Rai.